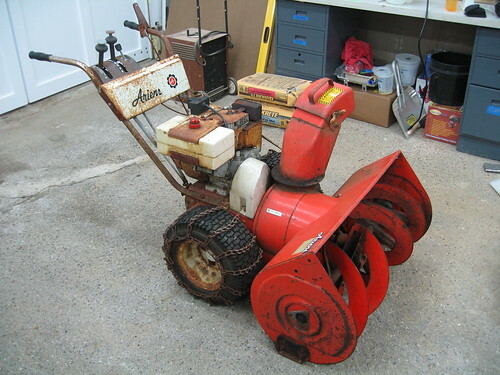 Last fall I bought a snow blower that was made in 1974, like me. 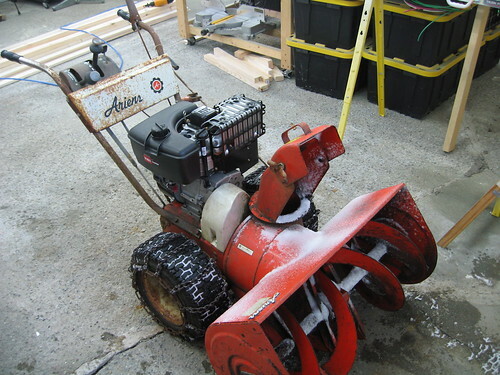 It’s a 32″ Ariens and it’s big and rusty and awesome. The guy I bought it from admitted it needed a carburetor rebuild, but it was only $250 and I saw an opportunity for a minor project. So I rebuilt the carb, which went pretty well, but it still didn’t seem to be putting out the 8hp it was designed to. I thought about doing an battery-powered electric conversion, but quickly found that the components alone would run me over $1000. 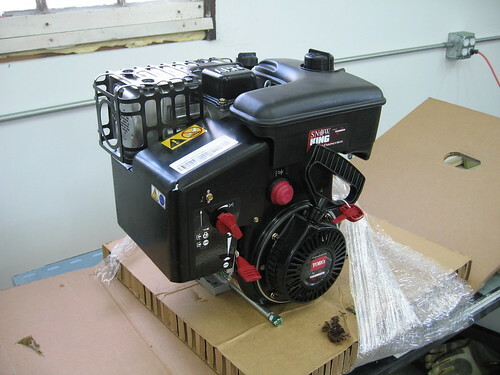 I found a guy in Minnesota that did a cool corded electric snow blower conversion that could be quite inexpensive, but I would really want the portability of battery power. It took two trips to the local lawnmower place — I couldn’t get the sheave off the old engine and then found the traction belt was worn out — but it bolted right on and fit perfectly, if a bit tighter than the old one. We still have some snow on the driveway so I took it for a little test spin. I was expecting to be launching snow onto the neighbor’s house with all that extra horsepower, but the snow is now icy and chunky so I wasn’t getting the distance I was hoping for. Next fresh snowfall I’ll see what this baby can do.